FORMER One Nation Senator Brian Burston has unleashed a blistering tirade in parliament towards the party, its leader Pauline Hanson and her prominent staffer James Ashby. Speaking under the protection of parliamentary privilege - just as Peter Dutton did yesterday when he attacked former Border Force commissioner Roman Quaedvlieg - Mr Burston compared Ms Hanson to Chinese president Xi Jinping. It was not meant as a compliment. "The Anzacs went to war to protect and defend our democracy. 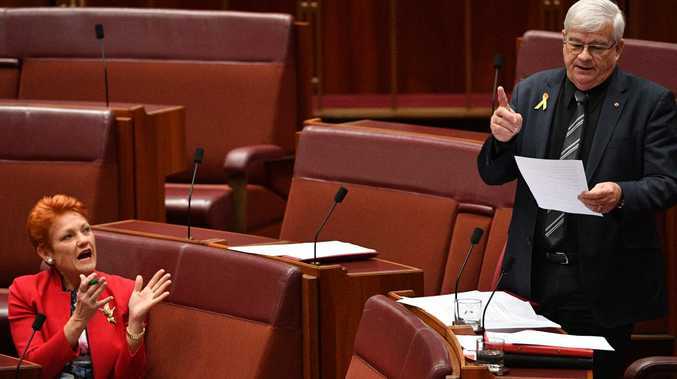 It is the right of every Australian - that is, provided that you are not a member of One Nation, because One Nation is the most un-Australian, undemocratic organisation in history," Senator Burston told the senate. He alleged Mr Ashby was controlling Ms Hanson behind the scenes. 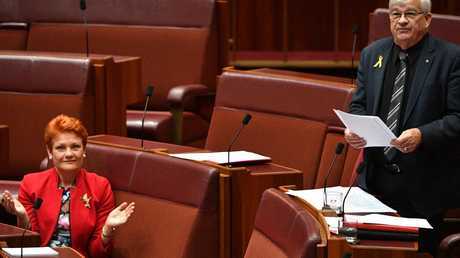 "Senator Hanson has declared herself president for life, just like the president of China. James Ashby told her to, because Jimmy controls her 24/7 - the not-so-faceless man of One Nation," he said. "She is the only Australian, and One Nation the only political party in Australia, that follows the dictatorship model." He claimed Ms Hanson had a "disagree with me and you're gone" attitude towards the rest of her party. Mr Burston dramatically quit One Nation to become an independent earlier this year after a running feud with Ms Hanson, who accused him of "stabbing me in the back" over the government's proposed company tax cuts. He later joined up with Clive Palmer's United Australia Party. He has history with Mr Ashby as well. Last weekend the Sunday Telegraph reported Mr Ashby had been caught sending Mr Burston expletive-laden texts, telling him to "f*** off idiot" and calling him a "traitorous c***". The texts were a response to Mr Burston, who had sent Mr Ashby a screenshot from Sky News showing One Nation's support in the polls had dropped. In the Senate today, Mr Burston called Mr Ashby "the proud holder of a criminal record" and alleged he "stalks my staff, both physically and by carrier service". 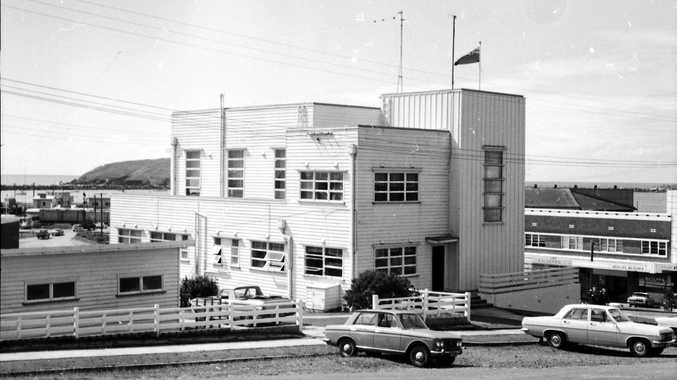 In 2002, Mr Ashby pleaded guilty to making abusive phone calls to a rival radio host. He was fined $2000 and given a three-year bond. He has no other criminal convictions, though he does have a controversial history in the political sphere. In 2012, Mr Ashby alleged he had been sexually harassed by Liberal MP Peter Slipper, for whom he worked as a media adviser. In 2014, after a long legal saga, he decided to drop the lawsuit. A year later the Australian Federal Police raided Mr Ashby's home as part of their investigation into another Liberal MP, Mal Brough, allegedly obtaining copies of Mr Slipper's diary illegally. Neither Mr Brough nor Mr Ashby were charged with any wrongdoing. Earlier this year, Mr Ashby was investigated for allegedly flying Ms Hanson around Queensland without the correct pilot's license. Mr Ashby said he did have the appropriate licence. Today Mr Burston also accused Mr Ashby of growing "quite wealthy" through "the One Nation gravy train". "People ask me why I left One Nation. I honour my word and handshake deals. I love my country and will not be a member of a party that is a dictatorship," Mr Burston said. Ms Hanson repeatedly interjected during the speech. "I just don't like lies," she said. A spokesperson for One Nation declined to comment.